TORONTO, ONTARIO--(Marketwire - Feb. 4, 2013) - To mark the official phase-out of the Canadian penny, Free The Children and RBC paid homage to the power of this humble coin today, announcing that young people across the country have collected 70 million pennies and counting, in support of the We Create Change penny drive. Totaling more than $700,000 - outweighing 32 elephants - the pennies support Free The Children's year-long Water Initiative to provide 100,000 people around the world with a permanent source of clean water. "We kicked off We Create Change at We Day events across the country last fall, asking students to join us on what we hope will become the largest penny drive in Canadian history," said Craig Kielburger, founder of Free The Children. "The 70 million pennies collected so far show just how enthusiastically Canada's youth have taken this campaign to heart. Our penny drive isn't over yet and already we have enough donations to provide more than 28,000 people in developing communities with clean water for life. Without hesitation, youth across Canada have shown that together we can make a lot of change." As a special one-time, week-long event, RBC is rolling out the blue carpet from Monday, February 4 to Saturday, February 9, inviting Canadians to support We Create Change and bring their loose pennies - any amount of pennies in any container (no need to roll or bag) - to any RBC Royal Bank branch in Canada. "We at RBC wanted to do something big, something we've never done before, to show our appreciation for the tremendous effort being made by young Canadians in support of this great cause," said Dave McKay, Group Head, Personal and Commercial Banking, RBC. "We're encouraging Canadians to be creative with their pennies this week - hold office penny drives, dip into coin jars and piggy banks, look under the couch - and then drop by any RBC branch to contribute to this penny drive and we'll take care of the rest." More than 2,100 schools across Canada are participating in We Create Change. Throughout the year, Canadian youth and educators - as well as other individual donors, businesses and organizations - have filled special Free The Children/RBC $25 penny bags as part of this campaign. When each penny bag is full, it holds $25 in pennies - enough to provide one person with clean water for life. To date, more than 28,000 bags have been dropped off at RBC branches. Following the loose pennies drop-off week, RBC branches will continue to accept filled $25 penny bags and rolled pennies in support of We Create Change, until the penny drive wraps up at the end of the school year (exact date to be confirmed). To date, the year-long Water Initiative has raised enough money to provide clean water for life to 65,000 people and counting, through donations, the penny drive and proceeds from sales of Me to We's Water Rafiki Friend chains. Free The Children is an international charity and educational partner that has more than 1.7 million young people involved in its programs in 45 countries. Founded in 1995 by international activist Craig Kielburger, Free The Children believes in a world where young people are free to achieve their fullest potential, and empowers youth to remove barriers that prevent them from being active local and global citizens. The organization's domestic programs-which include We Day, Free The Children's signature youth empowerment event-educate, engage and empower hundreds of thousands of youth in North America, the UK and around the world to become engaged global citizens. Its international projects have brought more than 650 schools and school rooms to youth and provided clean water and sanitation, health care and food security to one million people around the world, freeing children and their families from the cycle of poverty. The organization has received the World's Children's Prize for the Rights of the Child, the Human Rights Award from the World Association of Non-Governmental Organizations, and has formed successful partnerships with leading school boards and Oprah's Angel Network. For more information, visit www.freethechildren.com. RBC supports a diverse range of youth-focused initiatives across Canada, through sponsorships, donations and employee volunteer activities. Through long-term commitments with Free The Children, RBC supports We Day events across Canada, the We Schools in Action program and We Create Change and is the exclusive financial services sponsor of all Free The Children initiatives. In addition, RBC seeks to provide young people with the financial understanding and foundation to achieve secure financial futures by offering free financial advice and tools to students through the RBC Advice Centre and the RBC Financial Advice for Students website. For more information, visit www.rbcadvicecentre.com. As Canada phases out the penny, Free The Children and RBC pay tribute to the coin while celebrating the achievements of young people through Canada's largest youth-led penny drive. To date, more than 2,100 schools across Canada have collected more than 70 million pennies. Money raised supports Free The Children's year-long Water Initiative to provide 100,000 people with clean water for life. 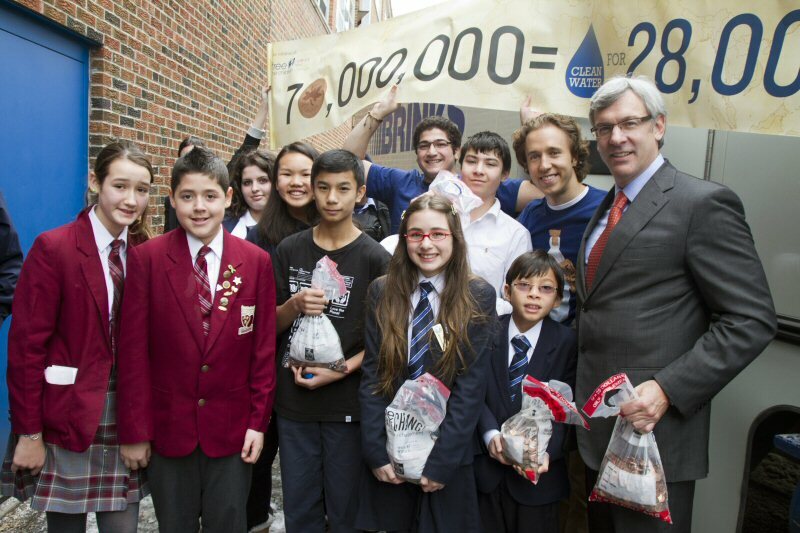 From right to left - Dave McKay, Group Head, Personal and Commercial Banking, RBC; Craig Kielburger, founder, Free The Children; and local students.